UPDATE: (18:02 CET) I just removed the question mark behind the headline! Yushenko’s lawyers were dressed for success: According breaking agency reports, Ukraine’s Supreme Court, after five days of hearing, just ruled that the disputed presidential election officially won by Ukrainian Prime Minister Viktor Yanukovich is invalid. Moreover, the court has not just backed Mr Yushchenko’s claims of systematic fraud. According to Reuters, the court’s Chairman Anatoly Yarema, said a “repeat vote” was necessary and should take place on Dec. 26. He apparently also suggested it would be a run-off vote only. Outgoing President Kuchma and Prime Minister Yanukovich had proposed a complete repeat of the election in a couple of months. [Original post starts here] I suppose the appearances of lawyers should not influence the outcome of any legal matter, yet according to Matthias Braun’s “Moskauerzeit“, the Russian newspaper Komersant (in Russian) noted that Mr Yushenko’s lawyers at the Supreme Court hearing are apparently not simply brighter than those representing Mr Yanukovich, but also clearly better dressed. Let’s hope this fashion statement won’t be turned into another round of speculations about European and American hard-money meddling in Ukraine. While the Supreme Court retired to deliberate about the verdict, the Ukrainian Parliament declared it would be in session all weekend, although earlier rumors about the introduction of price controls turned out to have been just that: rumors. I was reminded last night just how insidious the Yanukovych propaganda machine really is. My good friend Roma is from Russia but lives in Kiev. He only listens to the establishment channels for news, because he doesn’t like the Opposition. He’s a die-hard Yanukovych man. Why? “Because Yushchenko is like Hitler — he wants to kill all the Russians.” He can’t tell you why he thinks Yushchenko wants to do that, but he’s been convinced. If a young, well educated Kievite can be this blinded to reality, I can only imagine what Donetsk must be like. It should be noted at this point, however, that Yushenko’s national movement apparently has not just been supported by seemingly altruistic Western pro-democracy movements, but has significant ties to the Ukrainian nationalist right, including the – intended, or unintended – support from the far-right, which is flatly called “fashist” by some commentators. Clearly, for a plethora of reasons, this element of his coalition building is not given the appropriate attention at the moment. On the day on which the Russian Duma decided to further weaken Russian checks and balances (Spiegel Online, in German) – approving President Putin’s requests about the appointment of regional governors as well as raising the minimum membership of a “political party” to 50,000 (up from 10,000) with at least 500 (up from 100) members in at least 45 of the 89 Russian Regions – Veronica Khokhlova translates an article from Natalia Gervorkyan, a Russian journalist, about the “orange threat” for Russia, which makes the point I made about the “orange solution” a couple of posts down – albeit in a far more emotional manner. Beyond private interests, Russia has no reason to be too worried about losing influence in Kyiev: the countries are structurally too intertwined in too many ways. But authoritarian model of governance being practiced in Russia today has all reason to be worried about the organizational change being implemented in Kyiv right now. “[Ukrainians have] swept away the vertical supports and are bellowing so loudly it might wake our cattle, peacefully asleep for now. Orange threat! It’s crucial to act fast. First, to amend the anti-terrorism law, appropriately or not, with a ban on “actions that may affect the government’s ability to make decisions aimed at satisfying social and political demands and interests” of the protesters. So that it didn’t occur to them, God forbid, to come out into the streets and rally, as in Kiev, and to exert psychological pressure and demand their social and political rights. “The most important thing is that the Supreme Court, as the highest organ, must say if the violation occurred or not. The parliament has adopted a political decision. It is quite right, we must find a political solution. Quite frankly, reading this one should wonder if there was something wrong with his last Vodka. It becomes more and more apparent that – for all the power the protesters lend to Yushenko – they also significantly narrow down his mandate in negotiations. There is no way the protesters will simply go home and wait for the administration prepare another rigged vote in a couple of months. The window of opportunity for a peaceful solution is already beginning to close. As important as the rule of law is under normal circumstances, in this case, the rules have run out, and the people (on either side) are vociferously declaring who is Ukraine’s sovereign. Any further administrational attempt to trick them is unlikely to go down well. This may still end like it did in Nena’s song. 99 dreams I have had. In every one a red balloon. It’s all over and I’m standing pretty. In this dust that was a city. If I could find a souvenier. Just to prove the world was here. UPDATE: (21:56 CET) – Ukraine’s Supreme Court once again adjourned without reaching a decision. Meanwhile, behind the scenes dealing and public positioning in anticipation of the court’s verdict continues, as the rejection of two Yanukovich peititon by the court are interpreted by some opposition members as a very hopeful sign with respect to the overall decision. According to Spiegel Online and Reuters, Ukrainian President Kuchma has conditionally agreed to dismiss Prime Minister Yanukovich, who lost a vote of no confidence in the Ukrainian Parliament yesterday. His offer comes with some strings attached – while cautiously accepting the need for speed (Interfax) with respect to new elections, he still insists on holding a full election, not just the run-off demanded by Yushenko, and his concept of “speedy” still clearly exceeds the time-horizon of the opposition. The deteriorating economic and budgetary situation in Ukraine may be the central element in the President’s realization that the stand-off cannot be dragged-on until the protesters have frozen – although it is hard to determine to which extent his statements could be considered a threat indicating the increasing economic inevitability to end the protests, one way or another. Ten days on, and we may be close to a resolution of the crisis in the Ukraine. There’s definitely been some agreement between Kuchma, Yuschenko, Yanukovich and the mediators (Solana, Adamkus, Kubis and Kwasniewski) but, as ever, the devil is in the details. The basic points seem to be that there will be a revote, there will be constitutional reforms before the vote occurs, protestors will stop blockading government buildings and an all-party working group will implement changes based on the rulings of the Supreme Court. What form will the revote take? The full election, or just the second round? Will new candidates be allowed to stand, and will existing ones be barred from standing? Will more observers be allowed in for the elections, and will Yuschenko’s other requirements, such as limiting absentee ballots, be accepted? What form will the constiutional reforms take? The general opinion seems to be that the Prime Minister and Cabinet will gain powers from the Presidency, but is this to weaken a potential Yuschenko Presidency? And will the reforms address the regional issues? Where do the protestors go now? Blockades are over, but will some remain on the streets to keep the pressure on? Finally, what will the Supreme Court actually rule and when? It seems the election process can’t really begin until its deliberations are completed? As I said, reaction seems to be mixed amongst both the media and the bloggers as to whether this is the end of this stage of the crisis, or whether it still continues. See the Kyiv Post, PA/Scotsman, Le Sabot, Foreign Notes, Notes from Kiev and SCSU Scholars for more. In related news, The Argus notes that while the events in Ukraine may have inspired protestors in Tajikstan Uzbekistan, while attention’s been focused elsewhere, Russia is demanding Abkhazia reholds its recent election. Finally, I’ve received a report from Tarik Amar, who reported from Ukraine on John Quiggin’s blog last week. He’s been talking to the people in the tent city and you can read the full thing below the fold. It’s strange to think that it’s only a week since Ukraine exploded into the world’s attention. It’s also pretty incredible to think that for most of that week temperatures in Ukraine have been around and (mostly) below freezing, yet so much of this has been made on the streets. One thing that’s been true thtorughout the crisis is that we’ve had a lot of false climaxes – times when we thought everything was building up to a resolution of some sort – either good or bad – yet someone, somewhere, stepped back from the line and everything continued. Today could be yet another of those, with everyone waiting for the Supreme Court to decide on Yuschenko’s appeal, yet news reports over the weekend indicated that this isn’t simply one case, but a lot of little cases grouped together, each relating to a different charge of electoral fraud with the potential of there being a ruling due on each separate case. We could be here for the long haul waiting for them. Another new news source for you – Obozrevatel has begun an English language site (via Neeka, who has a few updates of her own) while the Guardian pulls its head out of its own backside and prints a good comment piece from Nick Paton Walsh, who’s actually in Kiev. There’s a comment I saw when I was looking through blogs – and I now can’t remember where I read it – that said the media outside Ukraine are being a lot more sceptical and pessimistic than comments from within the country, both from professional media and bloggers. It is certainly something I’ve noticed and seems to be heightened today with the secessionist threats of the east (and Yuschenko’s response) getting more attention outside than inside. As I’ve said before (and as Jon Edelstein noted in the comments on Scott’s post below) I think this is as much a negotiating ploy as a threat, using the ‘we’ll take our ball home if we can’t play with it’ argument. The problem for the secessionists is that they’re trying to push the issue too far, too fast (such as Donetsk’s threat to hold a referendum on the issue on this coming Sunday) to even pretend to be having a proper, democratic debate on the subject and thus losing the chance of there being any international recognition of their actions – outside parts of the CIS, anyway. Basically, BHHRG is what would exist if a cartoon version of Edmund Burke were divined into existence and asked to monitor elections in regions outside Western Christendom. More later, when we should have heard something from the Supreme Court. The Yorkshire Ranter also looks at the emergence of the protest movements, and points out that they’re not an ‘American creation’ as some have alleged, but can trace their lineage back to Solidarity and others. I’ve just got time for a quick roundup of the latest developments in Ukraine. First, and most importantly, the Supreme Court has suspended publication of the election result while it considers the case brought to it by Yuschenko. This is probably more routine than a sign of any clear intent on the part of the Court, but it does indicate that they’re taking the complaint seriously and are not dismissing it out of hand, as happened with a case Yuschenko brought earlier in the week, I believe. Also, according to The Periscope, Kazakhstan, China, and Armenia have recognized Yanukovych – probably unaware of the Supreme Court decision to not decide today. The situation in Ukraine itself appears to be developing into a standoff – Victor and friends keep posting at The Periscope and it seems to be following the same pattern as the last couple of days – rumours of movements of troops and miners, coupled with announcements of official support for Yuschenko from various locations. The latest news is that the Deputy Economy Minister has resigned and said he is ‘with the people’ and rumours are that Yanukovich is trying to make sure he has the loyalty of the rest of the Cabinet, particularly energy ministers. Maidan continues to post reports of military commanders stating they are with Yuschenko. The protest in Independence Square continues, of course, while strikes are taking place across the country in support of Yuschenko. There are also reports that Lech Walesa has tried to negotiate, but hasn’t achieved anything. He’s supposed to be holding a press conference around now, but there are no reports yet. Via Harry, PORA now have an online petition up which they’re asking people to sign. And quickly around the blogs – something new from Neeka, Le Sabot has photos and background. Update: (Tobias 18:11 CET) One more night to come up with a solution. In other good news, after having been approached by numerous government officials as well as cnocerned citizens, lieutenant-general Mykhaylo Kutsyn, officer in chief of the Western Operational Command of the Ukrainian Armed Forces stated that ? [his] actions are directed towards unquestioning fulfillment of the law and Constitution of Ukraine and [he] officially declare[d] that divisions of the Western Operational Command will not fight their own people.? 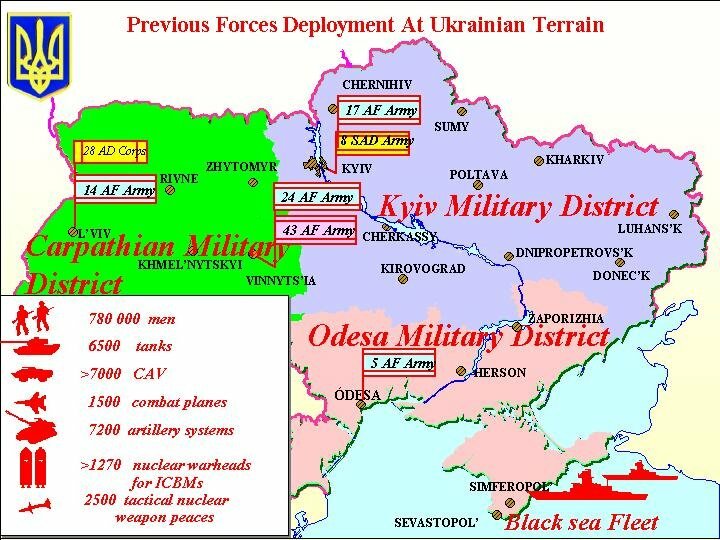 Update: (Tobias, 19:24 CET) Jamie of bloodandtreasure has a useful link to a Ukrainian military guide at globalsecurity.org. Apparently, Ukraine has three regional military commands, Western, Northern, and Southern (see this map). Kyev is situated in the Northern military command. Update: (Tobias, 21:17 CET) The showdown may have begun. Victor Katolyk reports that, following a “declaration of truth” by several hundred Ukrainian television employees, several tv stations have begun broadcasting “real” news. While several hundred Policemen appear to have pledged allegiance to the people, and former Deputy Prime Minister Julia Tymoshenko apparently declared the beginning of a seige of Presidential Administration, Cabinet of Ministers, and the Parliament, there are also reports of pressure on Supreme Courst judges and their families to rule in favor of Mr Yanukovich. While Russian President Putin, speaking at the EU-Russian summit in The Hague, remained firm that the victory of Prime Minister Viktor Yanukovich was “absolutely clear”, Dutch Prime Minister Jan Peter Balkenende finally clearly rejected the results as forged: “The election did not meet the international standards. Therefore the EU is not able to accept the result.” Maidan.net reports that the European Parliament will hold an emergency session devoted entirely to the situation in Ukraine next week. It could become a serious problem that President Putin has gone further than even the Ukrainian administration in “ruling out” any kind of negotiation and accusing the West of stirring violence in Kyev. Moreover, for the moment, Russia seems not concerned about developing an exit strategy, but is fueling the flames – according to EUbusiness.com, “the president of the foreign affairs committee of the State Duma lower house of parliament, Konstantin Kossachev, also made clear on Thursday it was time for Russia to defend its territory, after a period of letting the West ‘back such or such a leader of such or such a country of the post-Soviet space, as long as they were pro-Western and therefore anti-Russian'”. Such an official statement about Ukraine being Russian property will likely be counterproductive should it become widely known in Ukraine. Update: (Tobias, 22:33 CET) The FT wonders if Ukrainian Oligarchs, who have supported Yanukovich and clearly stood to gain from his victory, are now beginning to think about hedging their bets. Most remain wedded to Mr Yanukovich, especially the barons of his political heartlands in the industrialised Donetsk region. But a few are beginning to wonder whether Mr Yanukovich still offers the best protection for their interests. Many are also coming under pressure from employees who are openly supporting Mr Yushchenko – putting up posters in factories and workplaces and taking time off for demonstrations. “All political forces should negotiate and solve the situation without blood,” said parliament speaker Volodymyr Litvyn. A no-confidence vote in parliament would have carried political significance, but it would not have been binding. According to the Ukrainian constitution, a no-confidence vote must be initiated by the president – and outgoing President Leonid Kuchma has staunchly backed Yanukovych. Mykola Tomenko, a lawmaker and Yushchenko ally, said some police had joined the opposition, although the claim was impossible to independently verify. One police officer, wearing an orange ribbon in his uniform, ordered a group of police outside a government building to retreat inside, defusing tension between them and Yushchenko supporters. Kyiv’s city council and the administrations of four other sizable cities – Lviv, Ternopil, Vinnytsia and Ivano-Frankivsk – have refused to recognize the official results and they back Yushchenko. Elsewhere, idiotprogrammer discusses (the lack of) American coverage of what’s going on (though we have now been mentioned on Instapundit). Update: BBC News 24 reports (from the AFP wire) that Yushchenko has called on the police and army to come out and support him while miners are threatening to march on Kiev in support of Yanukovich. AFP also reports that Dutch Prime Minister Balkenende – the Netherlands currently holds the EU presidency – has informed Ukrainian President Kuchma that the EU has doubts about the result of the election. Update 2: The Periscope has lots of information, including translations of what’s being broadcast on Ukrainian radio right now. They also report that Javier Solana will be addressing the European Parliament’s Committee on Foreign Affairs tomorrow focusing on events in Ukraine. More blogging from Kiev at Le Sabot Post-Moderne. Interesting BBC News article on some of the background to the protests. It mentions a Ukrainian student group – Pora – who have connections with Georgia’s Kmara and Serbia’s Otpor movements, both of whom were at the forefront of the protests in their countries that overthrew governments. As several people have noted, Georgian flags are being displayed quite prominently amidst the protests. Although Mr Kuchma has spent a decade building an authoritarian regime, he has not established complete control – unlike President Vladimir Putin in neighbouring Russia – and it is unclear whether he can assure victory for his prime minister, Viktor Yanukovich. In particular, he does not control parliament or the Supreme Court, both of which could play a vital role in determining the victor. Critically, the president has failed to establish a reliable majority among parliament’s 450 members. Recently, Volodymyr Lytvyn, the speaker, and more than 30 deputies deserted the pro-presidential bloc, creating a stalemate in which neither Mr Yushchenko nor Mr Kuchma have a majority. Mr Kuchma cannot take the support of domestic institutions for granted, especially the Supreme Court, where judges enjoy independence thanks to lifetime appointments. Before the polls, the court acted in Mr Yushchenko’s favour by ordering the Central Election Commission to exclude 41 extra polling stations in Russia for the numerous Ukrainian citizens there amid concerns that they might be used for ballot fraud. After the first round, the court ordered the Central Election Commission to reverse a decision to exclude votes from a pro-Yushchenko district. As the widespread allegations of second-round fraud have shown, the government has attempted another challenge to institutions Mr Kuchma does not fully control. The authorities successfully ordered and bullied civil servants to co-operate in ballot-stuffing operations – ranging from university professors who applied unfair pressure on students to police officers who were paid to tour polling stations and vote more than once. But the machine did its job too well. The sheer scale of fraud required to swing the official results in Mr Yanukovich’s favour has provoked huge protests and international criticism. Update 3: Victor Katolyk’s live reports from Ukraine are in this Periscope thread. BBC News 24 just had live pictures from outside the Presidential offices where police are present in full riot gear and standing about 10-15 deep, completely blocking access to what appeared to be a large crowd of protestors. However, despite all that, things still seemed peaceful – the crowd was quite orderly and there was a gap between them and the police, with no signs of imminent trouble. At times like this, though, it only takes one hothead to spark a flame. * Putin seems to have made a major error of judgement in backing Mr Yanukovych. If the election result is overturned, he will have made an enemy of Yushchenko. * And if Yushchenko does win the Presidency he won’t have such a strong mandate from the people as Saakashvilli did in Georgia’s Rose Revolution (which, by the way, is celebrating its 1st anniversary today). Even if the election had been free and fair, I doubt Yushchenko would have won by more than a few points. There are deep East-West divisions in Ukraine which have bubbled to the surface this week. They won’t just go away. BBC News reports that Yushchenko has asked former Polish President Walesa to mediate in the crisis. Walesa is reported as saying he will if Ukrainian President Kuchma asks him to. Update 4: Right, one last set of updates then I need to get some sleep. Things seem to have quietened down now – it’s 2am in Ukraine right now (for reference, it’s GMT+2, CET+1, EST+7). Victor has continued to updates at The Periscope– the general trend seems to be reports of public and international support for Yuschenko, coupled with rumours of potential trouble from forces allied with Yanukovich tomorrow. There’s nothing we can do but sit and wait to see how those pan out. Yuschenko’s website in English (click on ‘ENG’ at the top of the screen) has lots of news, including a story that Mikhail Gorbachev has backed Yushchenko. Interesting posts from Daniel Brett and Coming Anarchy. There are many reports of international demonstrations and protests for Yushchenko tomorrow – I’ll add those to the thread above. Two more sites gathering and reporting news from Ukraine in English – Maidan and Brama.